ONE OF THE mysteries of life in the United States today is why we are not in the midst of a raging inflation, a depressing recession, or both. The answer, though, is staring us in the face. 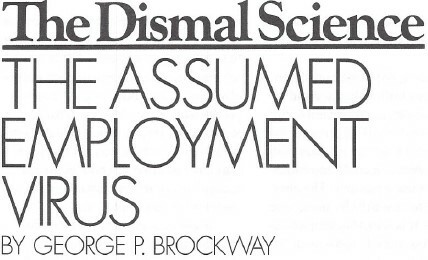 For the past 30 years, hard-nosed devotion to the theory of a natural rate of unemployment (a frequent target in this space) has been a prerequisite for appointment to the economics faculties of our major colleges and universities. Hence the doctrine has not only been taught at those institutions, it has been accepted respectfully in editorial rooms and enthusiastically in board rooms across the land. The theory, of course, claims that if too few people are unemployed, inflation will accelerate rapidly, and the only way to slow it down is to raise and keep raising the interest rate. Chairman Alan Greenspan of the Federal Reserve says he does not altogether agree with the theory. He keeps talking, however, about raising the interest rate on some unspecified occasion in the future. Yet today unemployment is lower than it has been for decades, while inflation (especially if you figure it as the Boskin Commission did a couple of years ago) has been practically invisible for at least four years. Moreover, during the same period the interest rate has been relatively stable. If mainstream economic theory were sound, the world would not move in this way. Nevertheless, the world does move in this way and, I make bold to predict, will continue to do so until the Baby Boomers start retiring in substantial numbers, at which point the present stock market boom will come to an end. I hasten to explain that I agree with Mr. Greenspan that the market is overenthusiastic, overpriced and in danger of collapsing. But I also think that as long as the Baby Boomers keep pouring their savings into it, and as long as the interest rate does not go up, the market will continue to rise in a classic example of the “law” of supply and demand. The situation is beautifully ironic. The market is all the bad and dangerous things Mr. Greenspan says, and he could stop them by jumping the interest rate-as the Reserve did in 1978 (not to mention 1929). But the Federal Reserve Board does not dare to act. Every three months the Reserve Board meets and the bankers anguish over their belief that inflation must be around the comer. Their terror, though, is that if they raise the interest rate to stop the inflation no one else can see, they will be remembered for having precipitated one of the great economic crashes of all time. So the booming stock market that concerns Mr. Greenspan has incidentally forced the Reserve into an unnoticed experiment that lays bare the fallacies of conventional interest rate policy. If the economics profession can bring itself to pay attention to what is happening in this accidental experiment, we may be spared further exposure to the barbarous theory of a natural rate of unemployment. Even without the experiment, the Reserve should have learned a few of the effects of raising the interest rate-at least five bad effects and one claimed to be good. The first thing it does is cause a drop in investment. By investment I don’t mean speculating in mutual stock funds and derivatives; I mean helping to finance the organization, continuation or expansion of companies that will produce goods and services to be sold in the marketplace and enjoyed by everyone. In the capitalist system, almost all investment depends directly or indirectly on credit, that is to say, borrowing. Let’s look at the record. In the early 1960s, when the Federal funds rate averaged about 2.7 per cent, annual investment ran over 21 per cent of the gross domestic product. Today the Federal funds rate is at 5.5 per cent, and investment is only 16 per cent of GDP in an economy that, according to Mr. Greenspan’s recent Congressional testimony, is one of the best he has seen. Second, an increase in the interest rate favors established and big businesses over small and start-up businesses. Since the latter provide most of the new jobs, any impediment to new business is an additional handicap for the poor, as well as for middle-class would-be entrepreneurs. Indeed, the percentage of American families living below the poverty line is higher in this economy that is one of the best Mr. Greenspan has seen than it was 25 years ago. The third thing raising the interest rate does is raise the unemployment rate. According to conventional theory this cruel absurdity is a good thing and the way things are supposed to be. Howsoever that may be, the unemployment rate today is 4.5 per cent, or lower than it has been since 1969. In the quarter century before 1969, though, there were no fewer than 12 years with a lower rate of unemployment than the 4.5 per cent of this economy that is one of the best Mr. Greenspan has seen. Fourth, raising the interest rate raises Federal, state, local, and school taxes, as the recent hoo-ha over the deficit has taught us all. Fifth, raising the interest rate is a principal way for the rich to become richer. Mr. Greenspan has more than once cited the widening gap between the rich and the poor as dangerous to our democracy. He has protested that it is a problem for Congress, not for him. But every interest payment is a transfer to the haves from the have-nots. To be sure, not everyone who borrows is down and out. Still, as a general rule, people who lend money are richer than those who borrow. The shift from 4 per cent (or lower) FHA and VA mortgages of 50 years ago to today’s “low” rate of 7 or 7.5 per cent has been a gift of billions (if not trillions) of dollars to mortgagees and a corresponding drain on mortgagers. No wonder the rate of home ownership has fallen in this economy that is one of the best Mr. Greenspan has seen. Now, I am not saying that the interest rate is solely responsible for the rich becoming richer and the poor poorer, and I am emphatically not against borrowing and lending and the charging of interest. I am saying that interest always has the immediate effect of taking from the poor and giving to the rich; that therefore the rich are richer and the poor poorer; that increasing the interest rate increases this effect; that the present rate does not improve matters (except in relation to the rates Mr. Greenspan’s predecessors gloried in); and that an unnecessary uncertainty is introduced into the economy by Mr. Greenspan’s unwillingness to specify conditions that would prompt him to raise the rates further. THAT’S the bad news-or some of it-about raising the interest rate. The good news-or what’s supposed to be good-is that raising the interest rate stops inflation. Well, no one can say it quite does that, because since World War II the Consumer Price Index has gone up in every year except 1955 (and that year the prime interest rate was lower than in any subsequent year) . But there have been 10 surges of the economy since World War II, and except for the present surge, every one of them was seen by economists as threatening to spiral into inflation and snubbed down by the Federal Reserve Board. In short, its raising the interest rate reduced the investment rate, increased the bankruptcy rate of businesses, increased the poverty rate, increased the cost of living, raised taxes, made the rich richer, caused nine recessions-and thus slowed the rate of inflation. Those consequences were not unpredictable. They are inherent in the nature of money, something conventional economics has archaic ideas about. Money has no price (there is no point in paying a dollar for a dollar bill). What money has is power-purchasing power and borrowing power. The piece of greenbacked paper you have in your pocket has no practical use as paper. It is an IOU of the state, was issued by the government in payment for some goods or services, and will be accepted by the government in payment of some tax or fee. It is accepted in private transactions because there are always, somewhere in the economy, citizens who need government IOUs to pay taxes or government fees. You may borrow the use of someone else’s money by paying a fee (interest), which is a cost to you and has the effect of diminishing the amount you can borrow. The relation of money to the fee for its use is similar to the relation of the price of a government bond (also an IOU) to the rate of interest. In both cases, the higher the interest rate, the lower the purchasing power (the effect on borrowing power, essential for investment, is even more severe). When one speaks of low purchasing power, it is the same as speaking of a high general price level. By upping the interest rate, the Federal Reserve Board reduces everyone’s purchasing power and thus increases the general price level. Raising the interest rate does not cure inflation; it causes it. (This, you may remember, is Brockway’s Law Number Two, first proclaimed here in the issue of January 9, 1989.) Raising the interest rate gives the appearance of stopping inflation because, on the supply side, it increases the costs of operating a business, discourages expansion and leads to downsizing, which, in turn, reduces wages and thereby contracts the demand side. In other words, raising the interest rate tends to bring about a recession. That is the way all threats of inflation have been contained since World War II -with a single exception, the present one. This time the Federal Reserve Board has refrained from raising the interest rate, as its governors would normally be inclined to. The current stock market boom has accidentally forced upon us an economic experiment of world shaking possibilities. We are finding that holding the interest rate steady does not cause inflation, even when the unemployment rate steadily falls. All the dismal prophecies of a natural rate of unemployment have proved false. Also proved false is the immoral claim that a decent minimum wage causes unemployment. With such empirical results in hand, we may be emboldened to take the next step and discover that lowering the interest rate can lower the price level, increase productive enterprise, and start the long task of healing the suppurating wound in our society that gapes between the rich and the poor. Ed – on this fifth factor, despite low interest rates in the Obama years the separation continues. Just speculatin’, but the current economy is fully “globalized” and has no Glass-Steagall. I SUBMIT that it’s time to give it up, quit, call a halt, put an end to the nonsense and the grief it has caused. The charade has had a run of almost 30 years. That is surely long enough for any group of people to toy with the wealth, health and happiness of their fellows. It was on December 29, 1967, that Professor Milton Friedman, then of the University of Chicago, in his presidential address to the American Economic Association, publicized the notion of a natural rate of unemployment-now known as the nonaccelerating inflation rate of unemployment, or NAIRU. The idea proved to be protean. Theorizing about it was a game anyone could play, and the game soon had as little resemblance to the one Friedman invented as the slam-dunk has to the shots invented by Dr. James Naismith of the YMCA College in Springfield, Massachusetts, in 1891. 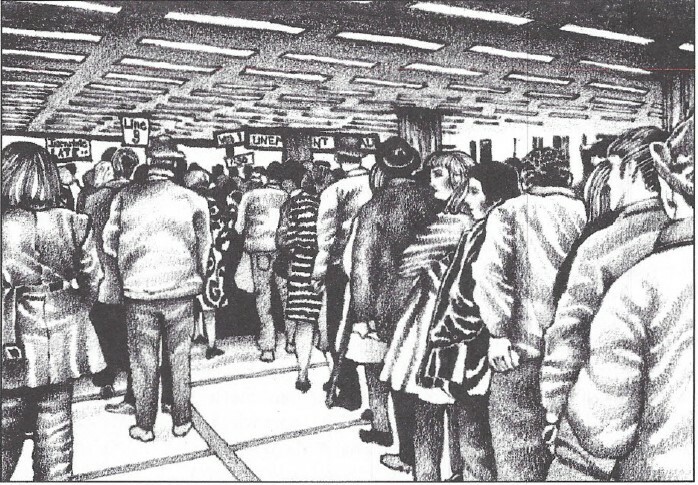 As the natural rate theories began to unfold, their beauty, not to say elegance, began to be appreciated. 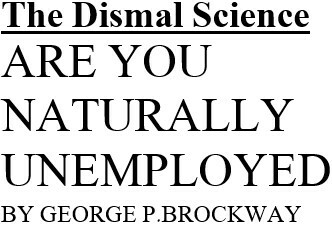 For, look you: If there is a natural rate of unemployment, the most difficult and most important questions of economics-those that have to do with people-are answered. Better, they’re made to disappear; there’s no point in asking them. To struggling scholars, the theory of a natural rate of unemployment has been a godsend. The frosting on the cake is Professor Friedman’s dictum that, for certain technical reasons, “the monetary authority [aka the Federal Reserve Board] cannot know what the ‘natural’ rate is.” This being accepted, tenure-track economists can consolidate their careers by writing learned articles conclusively demonstrating whatever rate tickles their fancy, and no one can say them nay. Well, that’s not quite right. Reasoning from the pronouncements of professional economists, we conclude that, whatever the actual rate of unemployment, the natural rate must always be higher, because the actual rate is always low enough to convince pundits that a lot of people must be fired at once to prevent runaway inflation, or to allow us to compete in the new global economy, or to keep the Federal Reserve from raising the interest rate and disquieting the stock market. In the new welfare-as-we-never-knew-it-world, we are beginning to push people off welfare and onto workfare, and we are beginning to see the absurdities and the nastiness of the schemes. In New York an attempt is being made to unionize the new workers. The local authorities are resisting on the ground that the new workers are not really workers at all, because they don’t work full time, and they don’t have vacations, and they don’t have proper tools and equipment, and they aren’t paid a living wage. I expect that the Bureau of Labor Statistics will go along and not count them, just as it didn’t count as employed the millions who worked for the CCC and WPA and the rest of the “alphabet soup” programs of New Deal days. (How else do you think unemployment hit 17.2 percent in 1939, as the books say it did, under that Old Democrat FDR?) These people were paid for what they did, and much of it survives for our pleasure and enlightenment to this day, but they didn’t get counted. Think what would happen to the natural rate of unemployment if the millions of victims of workfare were counted as really-truly workers. Once the states got the new system in full swing, unemployment would theoretically be cut at least in half-say, to 2 or 2.5 per cent. Inflation would of course go straight up; its curve would be vertical; and the interest rate would have to follow in hot pursuit. I, too, think that is absurd. But I ask you: Why is it absurd? Don’t tell me that most workfare workers aren’t eager to work. The same can be said for more than a few in the private sector, even at fairly exalted levels-which may explain why golf courses and ski runs are busy seven days a week, in season. After all, the “classics” held that work is a “disutility” that is overcome only when workers are tempted with high wages. The absurdity is not in the people, whether employed or unemployed. The absurdity is in the theory of a natural rate of unemployment. The theory is fallacious as well as vicious. The fallacy appears at the very beginning, where it is assumed that inflation is caused on the supply side by the cost of labor and on the demand side by the purchases of laborers. Labor costs are indeed the largest category of expenses, but they are only about 60 per cent of the Gross Domestic Product (GDP). The other 40 per cent includes rent, interest, insurance, taxes, and profits, which obviously don’t all move at the same slow pace as wages, or even in the same direction. Labor costs, moreover, are not homogeneous, but can be usefully divided into three categories with pretty distinctive behavior: the takings of the working rich (say, those with annual incomes in excess of $175,000); the wages of the working poor (those mired below the poverty level); and the salaries of the working middle class. So we have eight factor costs that affect the supply side of the price level, instead of the single omnibus wage cost of the NAIRU theory. Of the eight, four have certainly soared during the past couple of decades: interest, insurance, profits, and the takings of the working rich (entertainers’ professional athletes, business executives, and other celebrities). The salaries of the middle class, though, have stagnated, while the wages of the working poor have grievously fallen. Now, when the unemployment rate falls a tenth of a point because several hundred thousand people get jobs, who are the new workers? Well, a handful may be newly minted celebrities or previously downsized executives, but most of the rest meld into the bottom half of the working middle class or the working poor-categories that have not been responsible for inflation’s costs. Nor will the lower categories be responsible for any substantial increase on the demand side. These people, even when unemployed, already did a bit of demanding or consuming. They weren’t quite starving or freezing to death. The welfare reformers, in fact, thought they had it too good. Since most of the new workers will be paid close to the minimum wage (which is below the poverty level), they will not be able to demand much more in the way of goods and services than they did when unemployed. That is not the way things ought to be, but it shamefully is the way they are and will be for the foreseeable future. When unemployment falls, the new members of the working poor will not make a crucial difference to either the supply side or the demand side. Their effect on the price level will be negligible. They will, however, make a salutary contribution to the GDP, cause a great fall in welfare expenses, and add nicely to Federal and state and local tax receipts. IT IS IN EVERYWAY, at all levels, a good thing for unemployment to fall-and in a rational economy that would be a principal objective of public policy. Yet in the world of conventional economics, this happy event is irrationally supposed by NAIRU theorists to be the harbinger of inflation to come. It sets off a great hue and cry in the universities and on Wall Street, explaining why the Federal Reserve Board will have to–will be required by economic law to-raise the interest rate high enough to induce recession. As an example of the wild claims made by conventional economists, we may consider a 1990 proclamation by Professor Paul Krugman of MIT that if we tried to increase employment by 2 million people, “inflation would begin to accelerate rapidly.” In the event, employment was essentially unchanged for two years, and the Consumer Price Index (CPI) fell from 5.4 per cent to 3.0 per cent. Since 1992, employment has increased by over 4 million a year, and the CPI has, yes, fallen to 1.4 per cent. If we use the figures of the Boskin Commission that economists were praising last winter, inflation now is only 0.3 per cent-repeat, three-tenths of one per cent-a year. In its perennial struggle with the inflation banshee, the Federal Reserve has sponsored eight recessions since World War II. Not only were trillions of dollars’ worth of commodities never produced (it can be argued that we have too much stuff anyway), but millions of our fellow men and women were forced into poverty, their hopes for a better life dashed. That is a monstrous shame we all bear, a shame brought about by arrogance in league with ignorance. After 30 years, the ignorance is no longer excusable-if it ever was. We are at present in an economy whose unemployment rate is falling -even without counting our workfare fellows as employed-and whose inflation rate is approaching zero. And we have seen unemployment fall despite the conventionally feared minimum wage law, specifically mentioned by Professor Friedman as increasing the natural rate of unemployment. Federal Reserve Chairman Alan Greenspan, we have noted hopefully here more than once, claims not to be a believer in NAIRU. Nevertheless, in his recent semiannual testimony before Congress he felt obligated to warn that if things don’t slow down, the Reserve will raise the interest rate. Should he carry out his threat, he will hurt the poor and especially the lower middle class, who, as we have seen, are not responsible for inflation, and he will benefit the rich, who are to blame. This is not statesmanship; it is madness. Perhaps the Chairman still fears an over exuberant stock market. That may be sensible, but raising the interest rate will attempt to exorcise the fear by taking billions of dollars from the borrowers among us and giving them to the lenders. The attempt will succeed only if he manages to bring on another recession. This, too, is madness, not statesmanship. 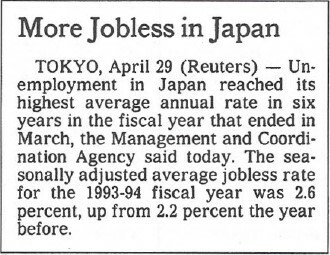 It is also NAIRU by another name. The natural rate of unemployment, the nonaccelerating inflation rate of unemployment, NAIRU-the whole mess-is fallacious in theory, erroneous in fact, and immoral in consequence. Let there be an end to it.